Troff is a document processing system, and it's part of the default UNIX text processing tools. Even though now it has been superseded by TEX and LATEX, troff is still quite common, as UNIX manual pages for the "man" command are written in troff, using the "man macros". "Since bare troff is unusable by humans, a race of gods now gone created macro packages for mortals to use." -- Brian Kernighan on the troff macro package. On some systems manpages are stored in compressed formats, so, before we operate on such a manpage, we need to uncompress it. Let's use groff and the man macros to convert a manpage to ps, and send it to the printer spooler. We could also send it to ps2pdf to publish the manpage as pdf. 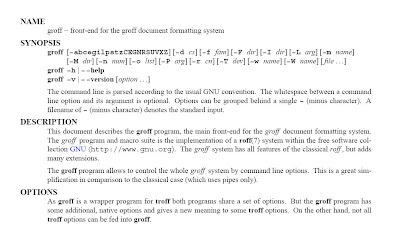 % cat /usr/share/man/man1/groff.1.gz | gunzip | groff -man > groff.ps && ps2pdf groff.ps && xpdf groff.pdf"
If you plan on doing anything serious with troff, you should take a look at Bell Labs Computing Science Technical Report #54, Troff User's Manual.